Mumbai (also known as Bombay, the official name until 1995) is the capital city of the Indian state of Maharashtra. It is the most populous city in India with an estimated city population of 18.4 million. It is also the wealthiest city in India. Mumbai is the financial, commercial and entertainment capital of India. The city also houses India's Hindi (Bollywood) and Marathi film and television industry. Chhatrapati Shivaji Terminus (CST) is a historic railway station in Mumbai, Maharashtra, India. Designed by Frederick William Stevens with influences from Victorian Italianate Gothic Revival architecture and traditional Mughal buildings, the station was built in 1887 in the Bori Bunder area of Mumbai to commemorate the Golden Jubilee of Queen Victoria. The new railway station was built on the location of the Bori Bunder Station and is one of the busiest railway stations in India, serving as a terminal for both long-distance trains and commuter trains of the Mumbai Suburban Railway. The station's name was changed to its present one in March 1996 and it is now known simply as CST (or CSTM). Bori Bunder was one of the areas along the Eastern shore line of Mumbai, India which was used as a storehouse for goods imported and exported from Mumbai. In the 1850s, the Great Indian Peninsular Railway built its railway terminus in this area and the station took its name as Bori Bunder. 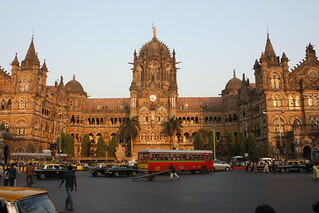 The station was eventually rebuilt as the Victoria Terminus, named after the then reigning Queen, and has been subsequently renamed Chhatrapati Shivaji Terminus after the 17th-century king.